Labour leader Ed Miliband has ruled out a coalition with Plaid Cymru as he made his first general election campaign visit to Wales. He said the election was a choice between the Conservatives "running the country for the rich" or Labour which "puts working people first". The Tories said on Saturday they plan to raise personal tax allowances to £12,500. The Liberal Democrats have announced proposals to boost apprenticeships. 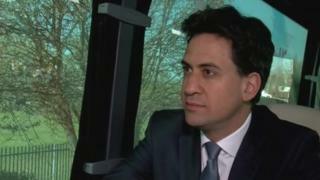 After rejecting any coalition while on a visit to Deeside, Mr Miliband said Labour having a majority government would be in the "best interest for Wales and the best interest of the UK". He said: "There's a big choice at this election. Do we have a Conservative government with David Cameron which runs the country for the richest and most powerful people? "Or do we have a Labour government led by me which puts working people first?" But, on Friday, Prime Minister David Cameron said people in Wales knew "more than most the damage Labour can do". Launching the Conservative election manifesto for Wales, in Powys, Mr Cameron said it was both "hypocrisy" and a source of shame that Welsh Labour had not protected health spending in the way his government had in England. Mr Miliband responded: "The way David Cameron has approached the issue is using Wales as a political football not trying to address the real reasons for this." He also defended the record of the Welsh Labour government and would not put a figure on future funding for Wales. Plaid Cymru leader Leanne Wood has also accused Labour of hypocrisy, for attacking Conservative public spending cuts while refusing to commit to reversing those cuts. Plaid Cymru MPs would not support a minority Labour government "that at its heart represents the worst excesses of austerity", she warned. But they have called for parity with Scotland on funding, saying it would amount to an extra £1.2bn a year to the Welsh budget. Also on Saturday, the Liberal Democrats announced what it calls plans to scrap the "jobs tax on young employees". The party says it wants to run a scheme exempting businesses from paying National Insurance on the earnings of apprentices aged under 25, due to come into force next year, for the remainder of the next parliament.